This evening, I was reading about how in less than a month, the JFK assassination files will be released (25 years after the 1992 Congressional Act authorizing it) and that only the president can prevent this. JFK’s 100th birthday was 9/27/2017. 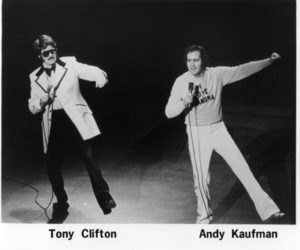 This made me think of Andy Kaufman, the R.E.M. 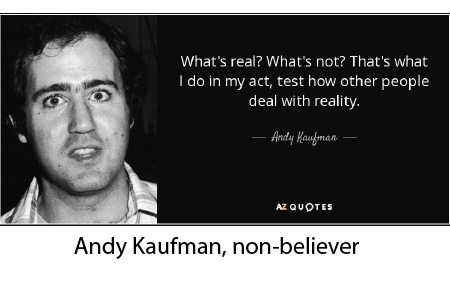 Song, “Man on the Moon” and Kaufman’s exploration of the nature of belief and gullibility. I seem to recall, although I can find no evidence of this biographical detail, that Andy Kaufman was very close to his grandmother. In fact, a posthumous work released in 2013 was entitled “Andy and his Grandmother”. At any rate, the heart-wrenching decryption key of this comedic genius’ soul was this indelibly tragic story that I cannot seem to corroborate. As I recall the story that has now, as if by Mandela Effect, disappeared from available internet sources, Kaufman was very close to his grandmother, even buying her a TV with remote with his first earnings as a child entertainer. When she died, his parents thought it best that they tell young Andy she moved away (like the proverbial family dog going upstate to a farm). The reason this story stuck with me was that it seemed to explain the deep anger, cynicism, and mocking of the audience’s credulity in so many of his characters. Imagine realizing that Santa Claus may not be 100% real. Now imagine coming to the slow realization that your grammy isn’t just avoiding you, she is dead and your parents lied to you about it. This brings us back full circle to JFK, the man who put the men on the moon (unless you believe it was really director Stanley Kubrick). Can you imagine that what occurs in the release of these documents three weeks hence will be the truth, the whole truth, and nothing but the truth? We all have things we believe in. They help us. But I would caution anyone who believes in false dichotomies like truth and lies. Andy Kaufman warned us that the Punch and Judy Show is staged by someone, after all. The stories we tell, from our origins, our parents’ imagined virtues and shortcomings, and even our own identities are based on axioms that can’t be proven from outside the system. We all live in the make-believe games and performance art of reality, eternally at the mercy of Göedel’s Incompleteness Theorem.